The 105th Tour de France is almost over, and today's stage will see the 146 riders still left in the peloton tackle the final mountain stage through the Pyrenees. Then on Saturday they head into a 31-kilometer individual time trial. The last two stages where the riders can shake things up in the General Classification. Tradition dictates that the top GC riders do not attack the Yellow Jersey on the final stage into Paris for the Tour's lap of honour up and down the Champs Elysées. That is, unless there is so little difference between the top riders' times that it all comes down to the final sprint after almost 3500 kilometers of racing! But that looks unlikely to happen this year. After three tough stages in the Alps, the peloton faces one last big mountains stage through the Pyrenees on Friday, climbing the Tourmalet and the Col d'Aubisque on one last last epic mountain stage. But even with three days still to go, there is little doubt that the winner of this year's Tour de France will once again be riding on handmade Continental tires when the race reaches the Arc de Triomphe in Paris. Britain's Geraint Thomas, who most people saw as chief lieutenant for four-times winner Chris Froome, will celebrate his first win in a Grand Tour on Sunday evening, escorted into Paris by his superb Team Sky teammates. Team Sky might have had the luxury of supporting two top-notch team leaders, but the other teams who have been using Continental equipment since the race set off from the Vendée on July 7 have also been hitting the headlines. 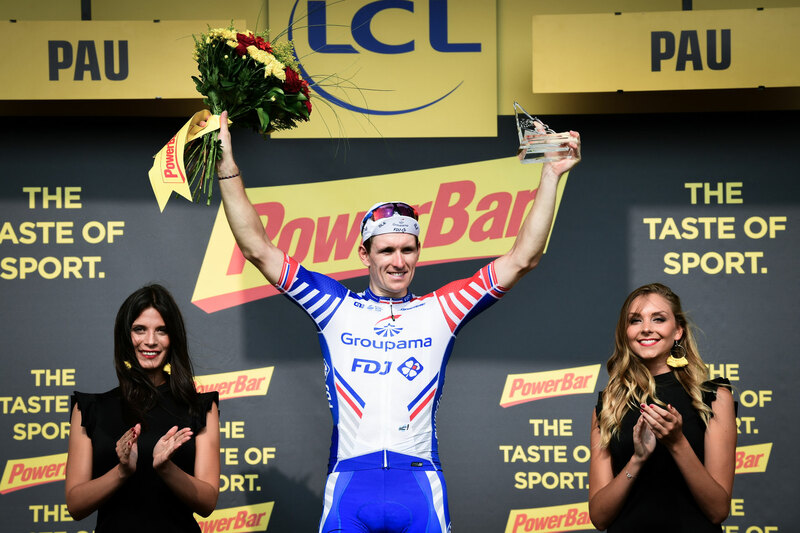 26-year old French rider Arnaud Démare (Groupama-FDJ) picked up his first stage win this year on Thursday's flat 172-kilometer stage from Trie-sur-Baïse to Pau. The yellow jersey is not the only leader's jersey being worn by riders using Continental tires as the Tour heads into its final three stages. Pierre Latour, riding for AG2R, is wearing the best young rider's white jersey, and the Spanish Movistar team are currently leading the Team competition, also on Continental tires. And with Nairo Quintana currently in fifth place, Movistar also have a top-five GC rider still very much in the race. 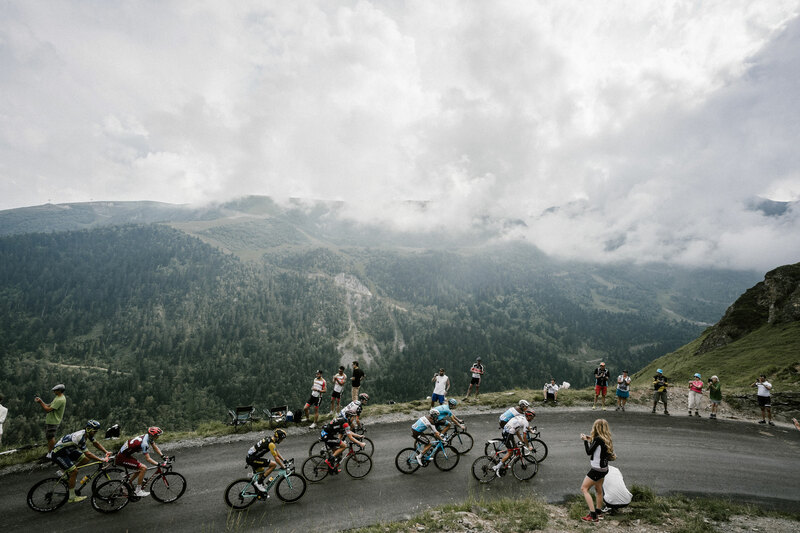 As the race made its way through the high mountains, the performance of the riders hasn't been the only aspect of the race to catch the attention. This year's race has featured the most unusual stage for many years. This is the 105th time the Tour de France has been held since it was first raced in 1903, but the organisers have still managed to come up with exciting new ideas. Race organisers ASO came up with something completely different for Stage 17 on Wednesday. Besides being just 65 kilometers, a short distance that guaranteed a high pace over two first-category climbs, the stage also featured a Formula 1-style grid start, something that has never been tried before in the Tour de France. The top 20 riders in the General Classification lined up in two rows at the front of the grid, in an approach that gave the riders something to think about and had an impact on the race. The staggered start caused several gaps on this nervous stage. Before the start, race leader Geraint Thomas, the Welshman who races for Team Sky, said: "It's an unusual stage, and it could be one of the decisive days in this year's Tour. Nobody really knows what's going to happen. There are more opportunities for someone to attack than you'd normally get on a mountain stage. If someone is not far behind the leaders and thinks they're still in with a chance, they could try and attack today." And that is exactly how things unfolded, with the stage that will go into the history books being fought out by teams and riders using Continental tires as the race headed up above 2,000 meters. 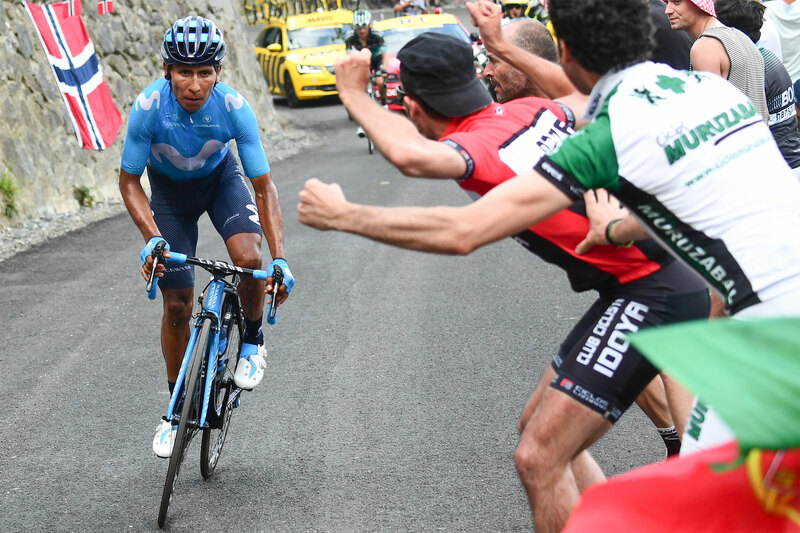 At the end of the 65-kilometer stage from Bagnères-de-Luchon to Saint-Lary-Soulan and on to the finish at the top of the 2,215-meter Col du Portet, Columbian rider Nairo Quintana put in a virtuoso performance to cross the line on his own as the stage winner. It will be something of a consolation prize for him, given that his hopes for overall victory in the Tour didn't work out this year. But overall victory was very much on the cards for the third rider to reach the finish line on this stage, Welshman Geraint Thomas. Chris Froome, who already has four Tour de France wins to his name and came to this race fresh from victory in this year's Giro d'Italia, saw his hopes of an elusive fifth win fade. He'll have to wait for another year to have a go at equalling the five wins of Jacques Anquetil and Bernard Hinault. It has been twenty years now since any rider managed to win the Giro and the Tour in the same year, with nobody achieving that double since Marco Pantani back in 1998. But heading into the last tough mountain stage on Friday and the time trial on Saturday, defending champion Froome will be determined to defend his third place overall. Team Sky are now clearly riding to support a win by Thomas, even though Froome is riding with the coveted "number 1" race number. Froome's goal of defending his podium place in Paris will be challenging enough, with fourth-placed Primoz Roglic (LottoNL-Jumbo) just 16 seconds behind him. And Roglic clearly doesn't want to settle for fourth place, putting in several attacks on Thursday that showed he is on top form at the moment. With three days left until the race reaches Paris, five of the top ten riders on General Classification are riding on Continental tires, with Thomas (1st), Froome (3rd), Quintana (5th), Spain's Mikel Landa (Movistar, 7th) and France's Romain Bardet (AG2R, 8th). They are heading up a field of 146 riders left in the race. But some of the teams using Continental's handmade tires from Korbach went into the Tour with the aim of supporting their team leader or one of his helpers to finish as high as possible in the General Classification. For Dimension Data, the focus was clearly on supporting team leader Mark Cavendish in the sprints, until he left the race early after missing the time cut in the Alps. The same was true at Katusha Alpecin, and they also had to make do without their top sprinter, Marcel Kittel, who won five stages in last year's Tour. But both those teams, like Bahrain Merida, kept sending riders up the road in breaks or working with other depleted teams to get involved in the day's racing. And that sort of fighting spirit has seen Bahrain Merida get their Italian rider Domenico Pozzovivo into a top-twenty placing with twentieth place in the General Classification. Placings bring money into the team coffers, with the money divided out between the riders at the end of the Tour. AG2R La Mondiale will be working to defend the best young rider's white jersey on the last day in the mountains. Their rider Pierre Latour has a lead of 6:27 minutes over second-placed French rider Guillaume Martin (Wanty-Groupe Gobert) in the young rider's competition. The white jersey for the best under-25 rider is also worth valuable money for the team when the race crosses the final finish line on the Champs Elysées in Paris on Sunday evening.